Pick Analysis: Florida State has had a slew of talented running backs over the past 30 years, but Cook was the first to break the 1,000-yard barrier in his first season with the team. The next two seasons have only gotten better, ranking in the top 10 by breaking 1,600 yards (1,691 in 2015 ranked sixth in the FBS, 1,765 in 2016 ranked fifth), scoring 19 times as a rusher, and earning first-team All-ACC accolades each year. The speedy and shifty back was also named 2016 first-team All-American by the Associated Press and Walter Camp Foundation, among others. NFL teams will be interested in his medical checks, though, because of the hamstring issues he had throughout the 2015 season and the three shoulder surgeries he's had since high school. Cook tore his rotator cuff in high school, then tore the front part of his labrum in 2014, and the back part of the labrum in 2016. He's also had run-ins with the law, starting in high school (robbery in 2009, charges dropped; firing and possessing a weapon on school property in 2010, charges drooped) and then again in 2015, where he was charged with misdemeanor battery outside a bar (found not guilty). Published: April 28, 2017 at 08:08 p.m. 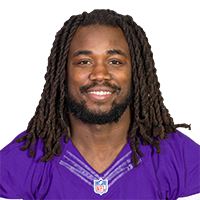 Pro Football Hall Of Famer John Randle announces the Minnesota Vikings selection of Florida State running back Dalvin Cook in Round 2 with the No. 41 pick overall in the 2017 NFL Draft. Published: April 28, 2017 at 08:04 p.m.
NFL Media?s Bucky Brooks, Matt Money, and Lance Zierlein give Dalvin Cook an A draft grade. Published: April 18, 2017 at 11:31 a.m. Which NFL running back does Dalvin Cook compare himself to? Here are five things you should know about the Florida State prospect. Published: March 13, 2017 at 05:58 p.m.
Dalvin Cook is a 2-time All-American out of Florida State, who surpassed Seminoles' legend Warrick Dunn, as the school's all-time leading rusher in 2016. For the better part of three seasons, Cook ran over, through, and past ACC defenses and now he looks to do the same in the NFL. Published: March 28, 2017 at 04:30 p.m. Check out the highlights from running back Dalvin Cook at Florida State's Pro Day.